I don't often run virtual races, but this was one I couldn't turn down. The medal is adorable and goes along with my growing collection of apple paraphernalia, and the cause is one I absolutely was willing to support. 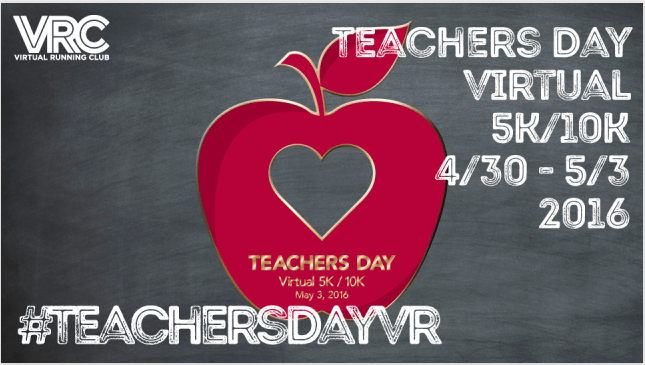 I signed up April 28 to run the Teacher's Day virtual race, and decided I may as well sign up for the 10k option because it was priced the same as the 5k and I was planning to run 8 miles on May 1 anyway. 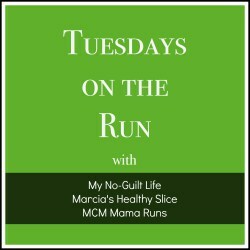 I had been starving Saturday night and definitely overindulged in carbs, but in the end I decided that was okay because I didn't want to be hungry or depleted on "race day." I also drank a ton of water Saturday, and I could tell it paid off! This was the longest run I'd done since the Marco half, and I was feeling a little nervous. I'm definitely in denial about summer's approach; I picked up Elizabeth and we began the run just before 7am. It was already sunny and warm. Luckily, the route I chose is fairly shady until about 9am, but it's time to start planning our long runs well before sunrise. Anyway, we saw Adria at the very start of the run and that seemed to get us off on the right foot. 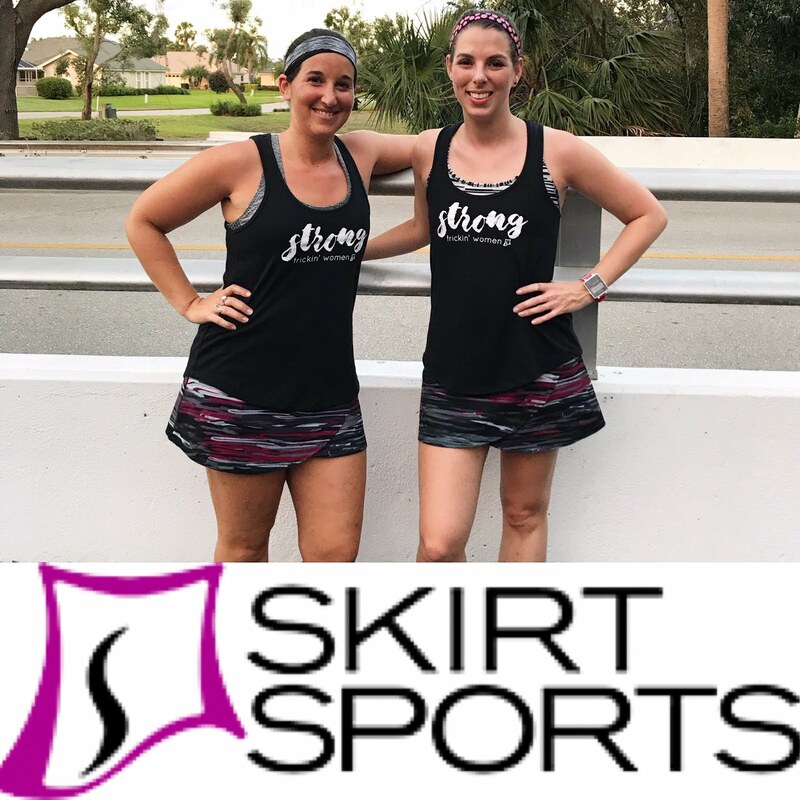 We kept our pace nice and consistent - I wanted to keep it slow and easy after Friday's run - and we ended up running very even splits! My calves were tight in the beginning, but I didn't let it worry me too much. At mile 3, my legs finally woke up and I started to feel really good. I slowly increased the pace; although we did have to pause at a couple crosswalks, we didn't take any walk breaks. I also didn't push too hard because 1) long runs are meant to be easy, and 2) Elizabeth was struggling a little toward the end. I had water with me in my Flip Belt but I didn't end up needing any. I felt totally unstoppable during the entire run. I just felt right. I love when that happens! I'm glad I got to try out the water bottles today even though I didn't use them. They were really comfortable, didn't bounce, and didn't leak! I didn't actually take any pictures on this run, which makes this race recap kind of lame. Sorry about that! I was just too "in the zone" to pause for pictures. Our overall pace was 10:56 and the run took 1:27; I was pretty happy with that because I'd estimated it would be 90 minutes. Technically, because the "race" portion of this run was the 10k, my time was ~1:08:40. I love that this easy-effort long run actually truly felt easy. It feels like my consistency is paying off and I know I could have pushed this and "raced" if I had wanted to. I came home and had a hardboiled egg, then showered and took a very long nap. Later in the afternoon I had may last piece of flourless chocolate cake and ice cream to celebrate. All in all, this was a great long run and a solid "race"! Great job!!! I love reading about your new speed adventures! That medal is super cute! Does UCAN have a good consistency? I have wanted to try it but haven't convinced myself to try it. I was using Tailwind but I am not liking it as much on long runs. I want to go to a mostly liquid fueling strategy as the gels just hurt my gut after a couple go down. That's why I started drinking it before my marathon - to practice with it. I've tried a lot of different things and "miracle" drinks and this one really works for me. What a great virtual! Is that flip belt a new design or can you purchase those water bottles to slip inside? I have a flip belt but never thought about putting water bottles in it. I' like to try that out! I have the original Flip Belt; they just released bottles (6oz or 11oz) that fit in it! The bottles fit nicely and don't make the belt bounce at all. They didn't make the belt tighter than usual, either. You can get them on their website, and they're not expensive at all! I'm glad your speed and consistency is paying off! Good job on your 10k! Nice job! I'm super glad that you're feeling strong and in the zone. I love it when that happens on a run. The miles just fly by and you feel like you can do anything. There's really nothing like that feeling! Glad it was a great run for you! And that is an awesome medal. I just couldn't say no to an apple! Great job on racing & keeping it easy! I have an old flipbelt but didn't know they have newer ones with water bottles. Taht is really, really, really intriguing. I used to use a fuel belt, but I got tired of it bouncing and chafing up my running clothes. Now I use a handlheld bottle, which I like but . . . see, there I go with the IDI (or NEED it!) again! I have the original Flip Belt; they just released bottles (6oz or 11oz) that fit in it! The bottles fit nicely and don't make the belt bounce at all. They didn't make the belt tighter than usual, either. I'm always looking for a better option for water on the run, and this is really nice for shorter distances where 6-12oz is enough. Woo-hoo! I love it when everything falls into place. Reminds me of why the heck I put myself through so many miles. ;) Great job! Exactly - it starts to feel like everything is paying off and worth it! I've always wanted to try UCan but I'm worried about the taste...does it have an after taste? What's you favorite flavor? UCAN is very subtly sweet. Depending on how much water you mix it with, it's not sweet at ALL. It doesn't have the chalky after taste of protein powder and I find it very lightly flavored. I really like the orange, and I'm using the cocoa now (and mixing it with coffee and water instead of just water) and it's very easy to drink. I prefer the orange but I like that I can mix the cocoa flavor with coffee!